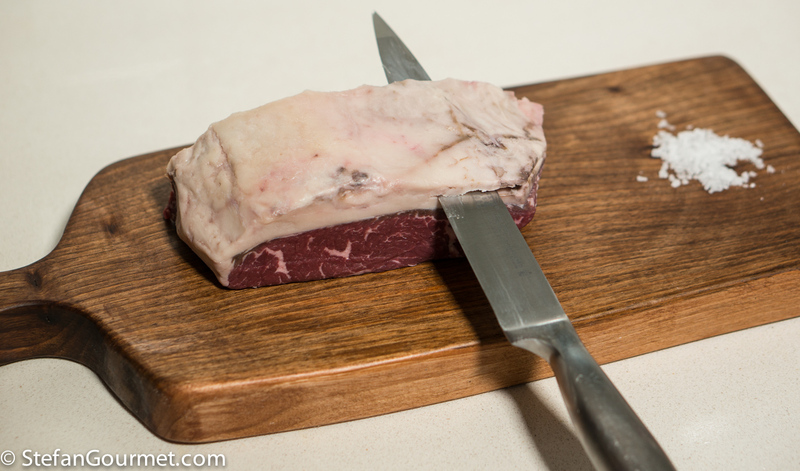 Picanha is a cut of beef that is very popular in Brazil and Argentina, that is known as “rump cap” in the United States or as staartstuk in the Netherlands. It is a tender and flavorful piece of beef from the rear of the animal with a fat cap on top. In South America it is often served with chimichurri sauce, a green sauce with parsley, olive oil, and vinegar as its main ingredients. Trim most of the fat cap away, as the sous-vide cooking won’t render the fat. Leave a thin layer of fat on for flavor, and reserve the remaining fat for another use. Score the fat layer in a criss cross pattern. 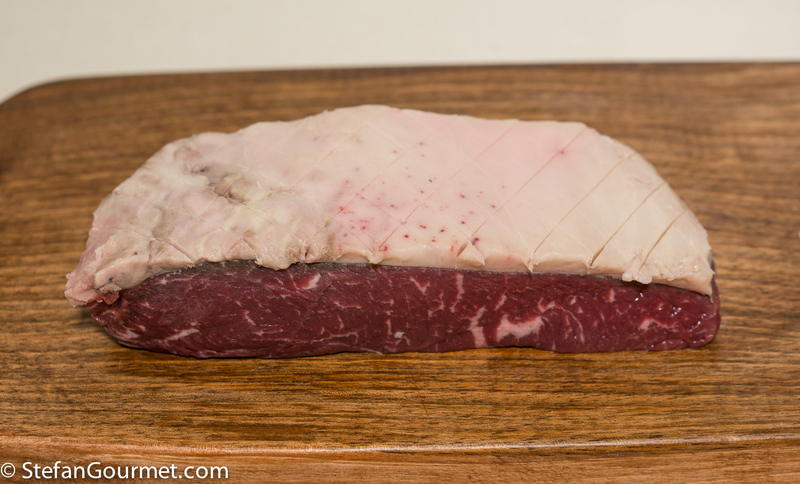 Season the picanha on all sides with salt. 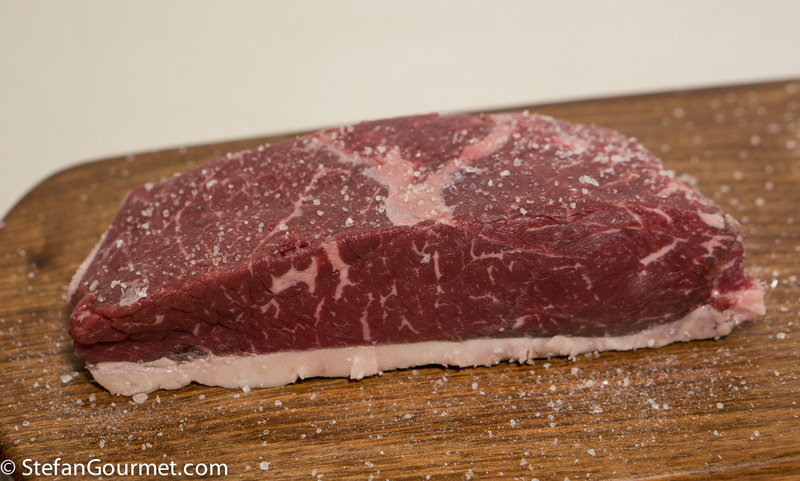 Vacuum seal it and cook sous-vide for 2 hours at 55C/131F. 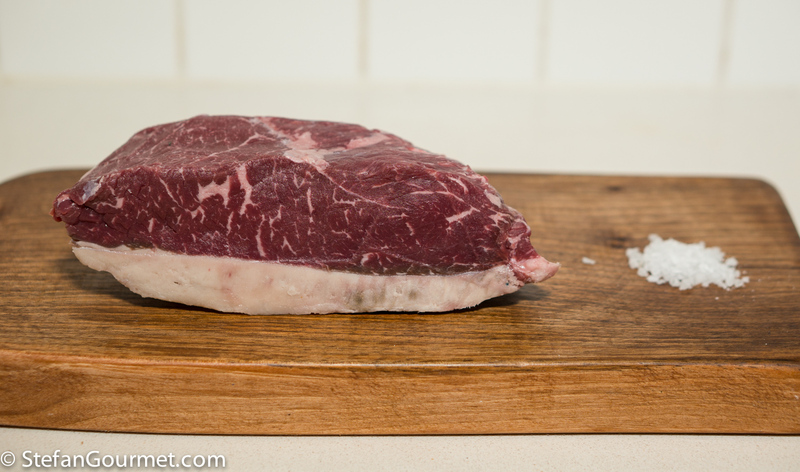 Since this is a tender piece of meat, you only need to cook it until the core of the meat reaches 55C/131F. …and stir to mix. 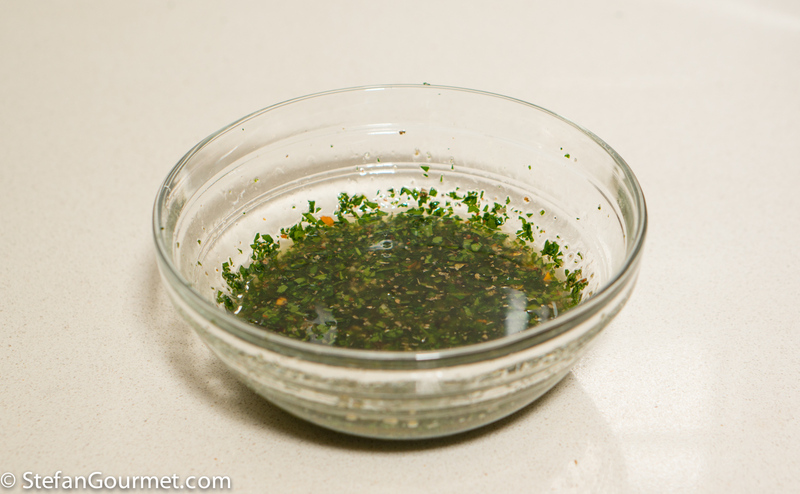 That’s it, your chimichurri sauce is done. You may wish to taste it and adjust it to your liking. 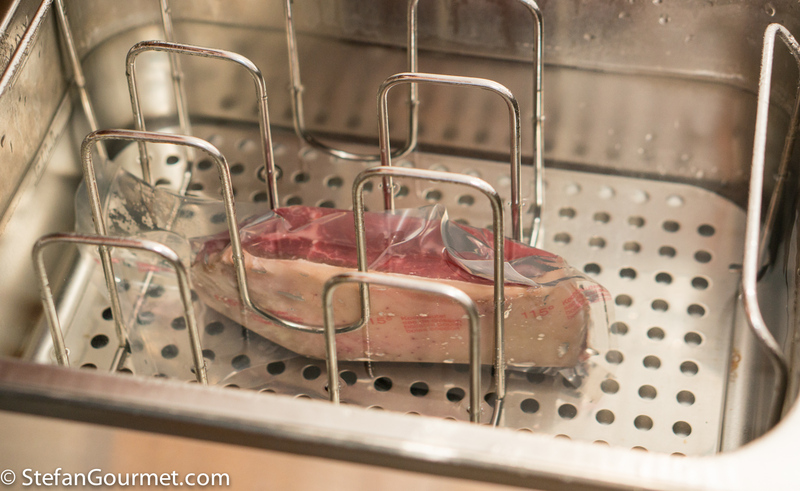 When the picanha has finished cooking sous-vide, plunge the sous-vide bag with the meat in cold water for about 5 minutes so the outside will cool off a little. 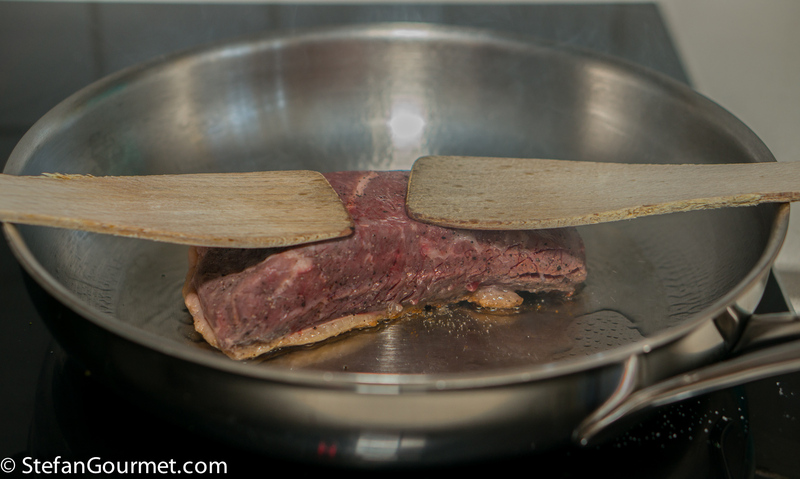 This is to prevent overcooking the meat while searing it. While the meat is cooling off, preheat a frying pan or the broiler (or start a bit earlier if you want to use a charcoal grill). The charcoal grill will provide the best flavor, but it is a lot of work to start a charcoal fire if you are only going to use it to sear the one piece of picanha. 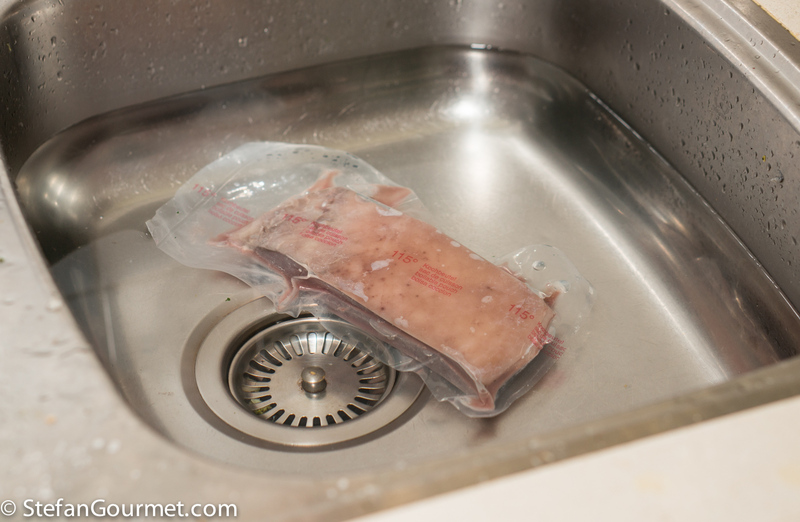 After the meat has cooled off for 5 minutes, take it out of the sous-vide bag and pat dry with paper towels. 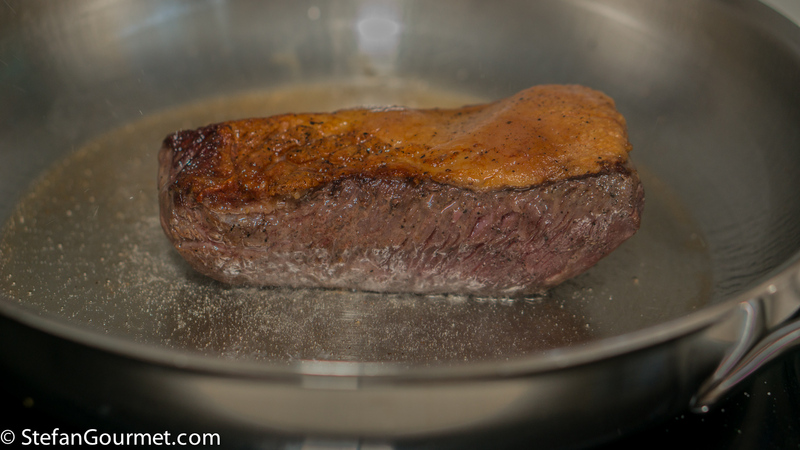 Dry meat will make for a better sear. Sear the meat using one of the three methods. When using the broiler, it should be very close to the broiling element (about 5 cm or 2 inches) as you want to get a good sear as quickly as possible (without overcooking the meat). The fat cap should be on top. The same goes for the charcoal grill: the coals should be very hot and the meat should be very close to it, with the fat cap facing the heat. You should not be able to hold your hand for more than a second at the spot where the meat is going to be. When using a pan, there is no need to add any oil or butter. Simply start with the fat side, and the fat will render from it. Make sure the frying pan is very very hot before you begin and press the meat down. 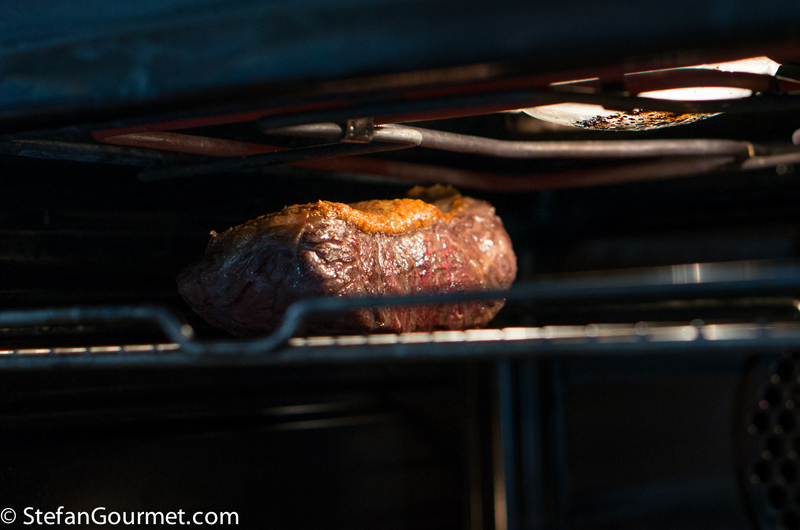 Briefly sear the other sides as well in the fat that has rendered. 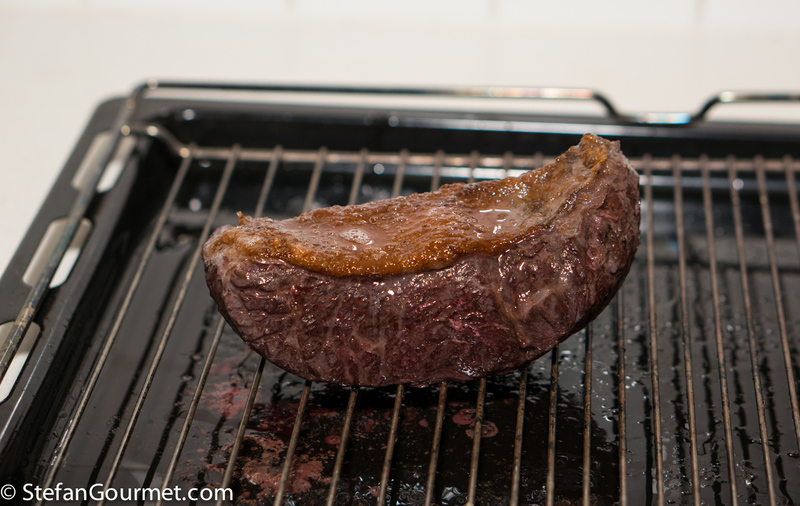 The searing is done when the fat cap is nicely browned. 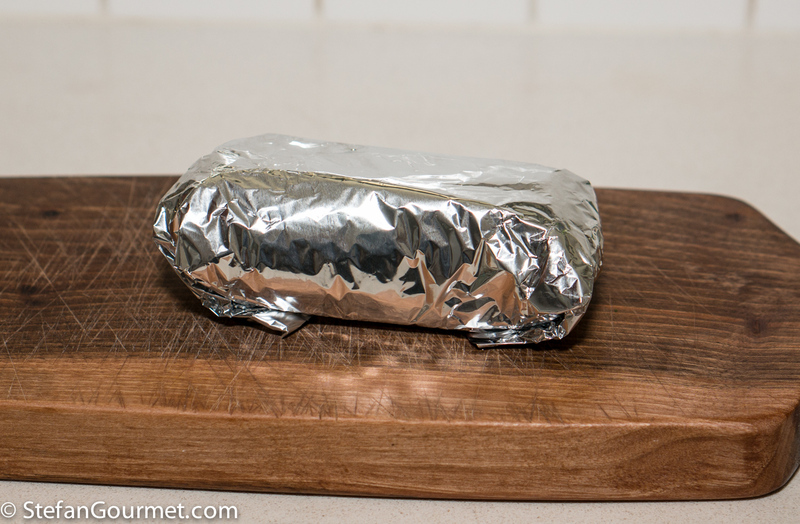 After searing, wrap the meat in aluminum foil and allow it to rest for about 10 minutes. 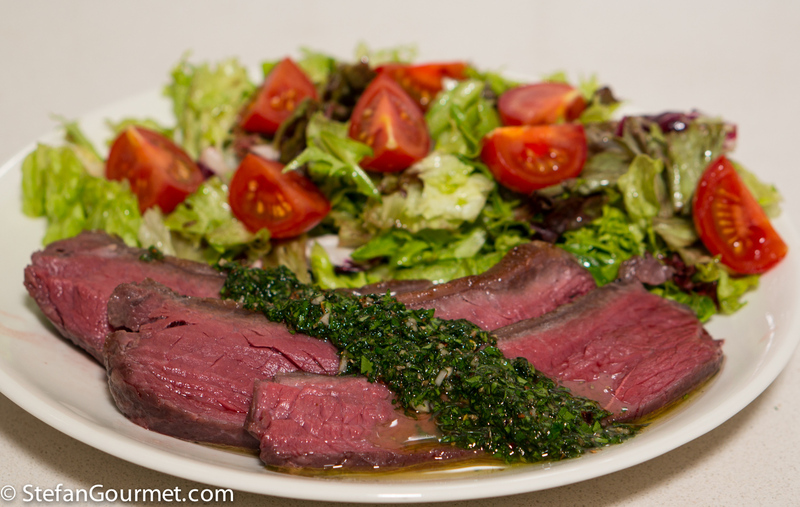 Serve with the chimichurri sauce and a salad. Although a Malbec from Mendoza in Argentina would be a ‘local’ wine pairing, I prefer this with a medium-bodied Chianti because of the chimichurri. 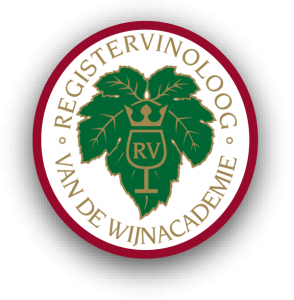 The acidity of the Chianti can handle the red wine vinegar in the chimichurri a lot better than most Malbecs. Mackerel is a cheap and tasty fish, and healthy because it’s loaded with omega-3 fatty acids. A simple and tasty way to prepare it, is to roast mackerel in the oven with vegetables. I attended a cookery course in Buenos Aires a few years ago and I can honestly say your version is very close to the original and looks as delicious although in Argentina they rarely serve it with salad. Just bread if anything. I’ve never been to Argentina, but I’ve heard that beef is cheaper than vegetables there (and eaten more often). Stefan, I don’t know if it’s the new lights or what but those photos are really delicious looking. Another sous vide masterclass. I’ve been using the lights for a while now, they just weren’t mounted properly yet. They have improved the colors, which is most visible with beef and the like. That set of shots is really excellent. Love it. What a gorgeous hunk of meat! I’ve seen so many variations that I decided I could present my own version 🙂 I also saw a lot of them with cilantro, but I am among those who are not crazy about it. I’ll try aging it the next time around — thanks for the tip! Excellant post! Another good finish would be deep fried for 15 to 30 seconds. It does wonders for beef tenderlion… finishes every nook and cranny. 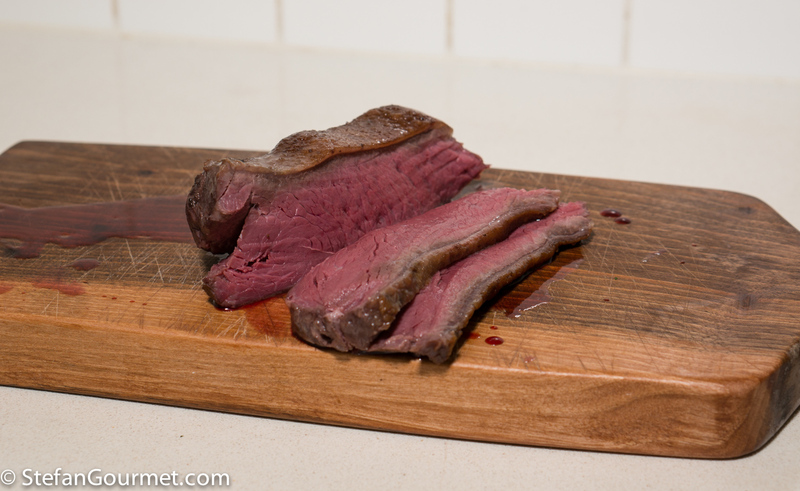 I do like finishing sous-vide cooked beef in the deep fryer, especially if beef suet is the fat. It definitely works for beef tenderloin or other lean cuts. For picanha I’m not really sure if it would brown the fat cap as nicely (and fast enough). Definitely not in 15 to 30 seconds. Have allowed max time to find your piece of meat . . . quite unsuccessfully . . . but quite believe I have found reasonable substitutes. 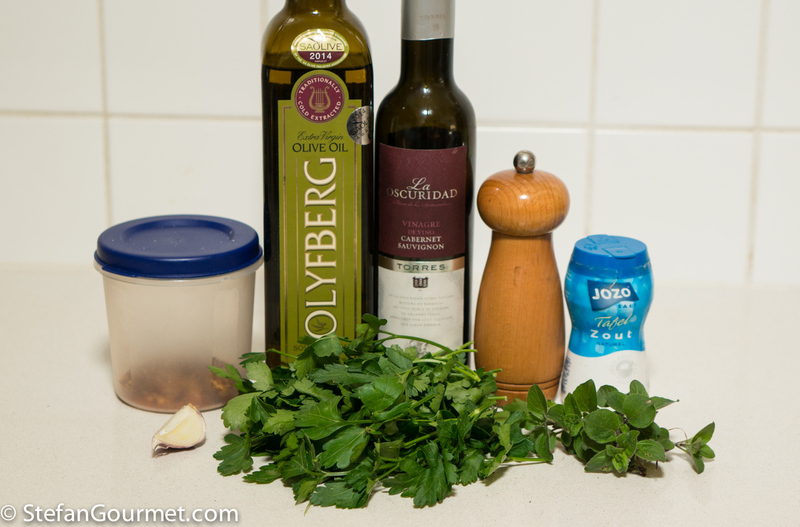 You and I have to agree to make chimichurri a wee bit differently: mine has heaps more fresh oregano, some more parsley and mint also . . . I go for wee bit more garlic . . . all fresh naturally 🙂 ! All recipes from actual Argentinian cooks . . . to each their own etc . . . a soft SA red to sip alongside . . . what a pleasant way to spend an evening . . . When I was in Australia I noticed that all the cuts of beef had different names, so I am not surprised you find it hard to find. 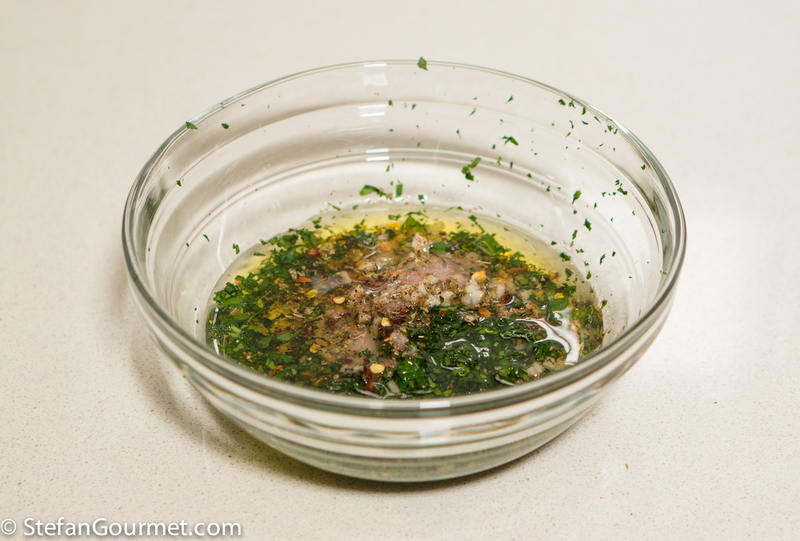 Chimichurri is one of those sauces that doesn’t have a fixed recipe. 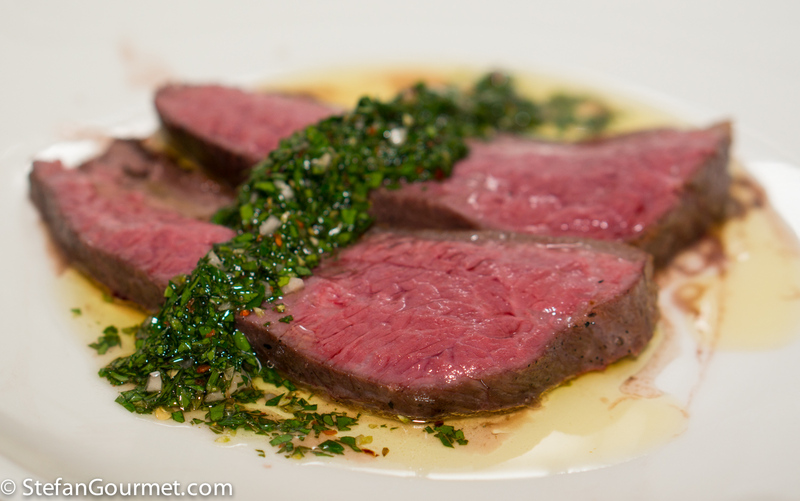 Chimichurri looks like the perfect accompaniment to this beautiful piece of beef Stefan. Almost dinner time here and you’ve got me wishing that this was on the menu tonight! Fantastica. Resto sempre affascinato dalla tua tecnica. Hi Stefan, I got a veal picanha on the menu for tonight. The picanha was frozen. I wonder if I can prepare it sous vide in the same packing. Or should I unpack it and put it in a new sous vide bag (then with herbs of course)? 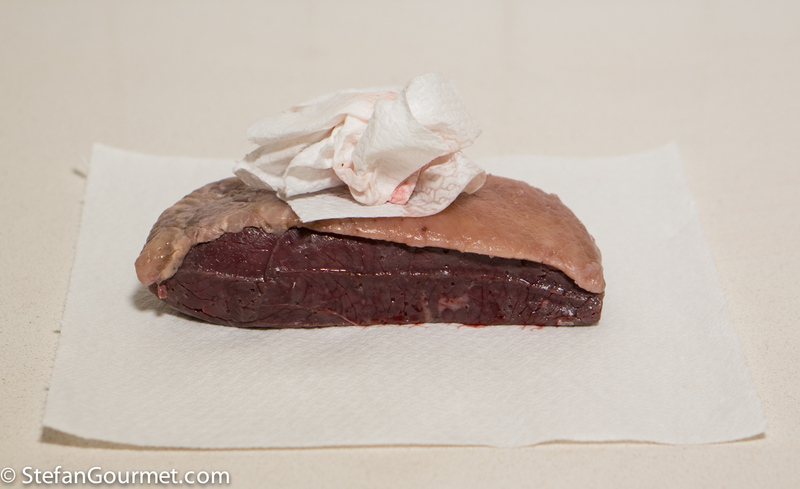 You have probably noticed when you open vacuum packed meat that it often has an unpleasant smell. This is caused by nitrogen bacteria that are active in an anaerobic environment (without oxygen) and that are harmless. However, you want to wash away that smell before cooking the meat sous-vide, because otherwise the smell can become stronger. How did it turn out? What time and temperature did you use? Really delicious although the herbes (lemongrass and fresh oregano) were vanished. As my company arrived a little late (but who cares with sous vide 🙂 ) the picanha was for almost 3 hours on 53 degrees Celsius in my oven.